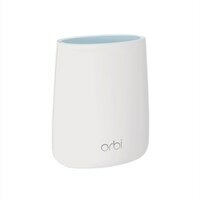 Orbi Tri-Band WiFi Router lets you set up and manage your WiFi network in minutes using the Orbi app. Super-fast WiFi up to 2.2Gbps for seamless 4K HD video streaming and gaming from everywhere in your home. Sleek, modern design with high-gain internal antennas increases coverage. Start with an Orbi Router, then create an Orbi whole-home mesh WiFi system by adding Orbi Satellites (sold separately). Circle with Disney runs on Orbi Routers for a smart way for families to manage content and time online, on any connected device. Provide internet access to guests without sharing your personal network password. Ready right out of the box and works with your internet service provider for better WiFi, everywhere.